This recipe was originally published on December 21, 2014 and republished on December 9, 2017 with updated content, photos and a video. Mostaccioli are Christmas cookies which are extremely popular in southern Italy, particularly among Neapolitans. As is usually the case with regional Italian cooking, you will find endless variations. Today, I would like to share my version which I have called Mostaccioli di Mamma. The whole process of making these cookies begins by grinding about one pound of almonds, skin on and not roasted. The texture we are looking for is coarsely ground. This will provide a cookie where fragments of almonds are visible. We then need to incorporate these ground almonds with the dry ingredients which have been sifted together. As far as the liquid ingredients are concerned, it is simply a question of slowly whipping up the ingredients together, one by one in your stand mixer. The addition of a pound of honey confirms that these are definitely a chocolaty honey cookie. 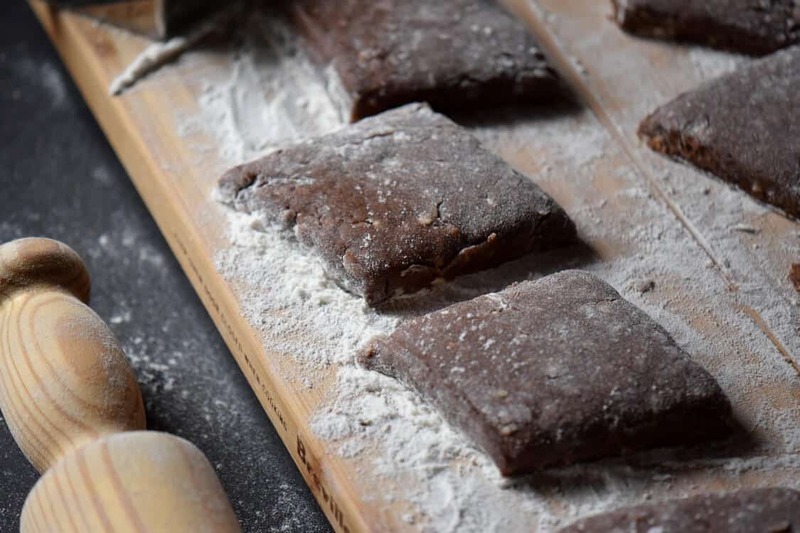 With the help of a large serving wooden spoon, transfer some dough on a well floured wooden board and roll out the dough to about 1/4-1/2 inch thickness. This is a soft dough to work with but once you get the hang of it, it gets easier. If you are having a hard time, you can refrigerate the dough for 10-15 minutes. The dough will then be easier to roll as it gets a lot firmer. These Mostaccioli di Mamma are definitively not your typical cookie. To begin with, they have a very distinct rhombus shape, so we are going to use a cookie cutter to guide us in order for the cookies to have the same shape. Once they have baked and cooled, it is time for the icing. 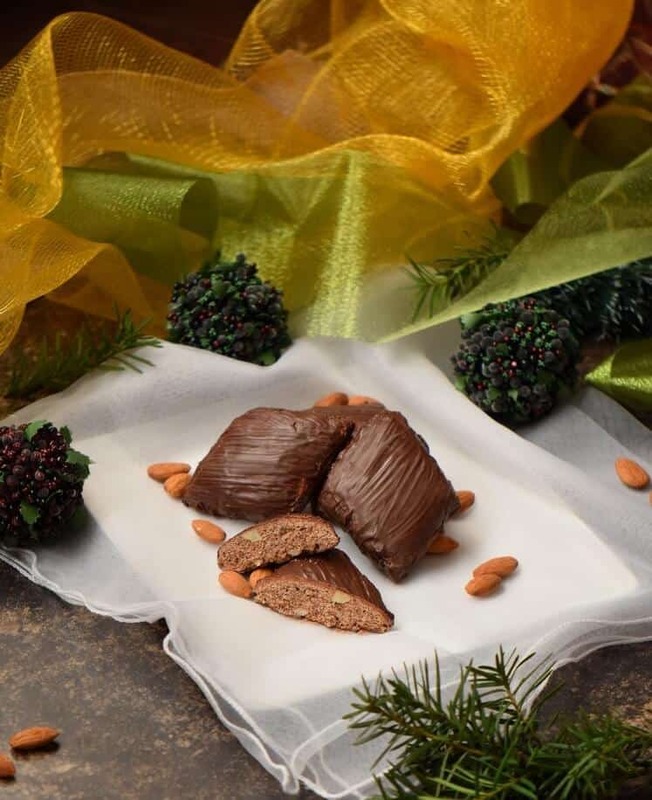 Part of what makes these mostaccioli so irresistible is the combination of the dark chocolate coating, the spices and the honey. Make sure to use a high-quality chocolate as this will make a big difference in the overall quality of the cookie. I was extremely privileged to be raised in a family where Italian traditions, especially food traditions, were extremely important. As such, there was such a frenzy surrounding any holiday period… with Easter it was all about the fiadone and rice ricotta cakes; on Saint Joseph Day we had this special pasta and of course these Zeppole di San Giuseppe; and then, there was Christmas 🙂 (just click on the the word Christmas and you will be directed to the recipe index of Christmas recipes on this site). Both my parents originated from the South of Italy. My mom’s birthplace was Molinare (Benevento) and my dad was from Ripabottoni (Campobasso) and so, you can well imagine all the wonderful food I grew up with. Naturally I had my favorites, which I will continue to document and share with all of you. This recipe for Mostaccioli di Mamma would always be made by my mom at Christmas time. I have seen (and tried) many variations of Mostaccioli. To this day, this is still one of my favorite cookies. Over the years, I have made a few really minor changes to the recipe. I increased both the amount of flour and orange juice which resulted in a softer textured cookie. As far as the icing is concerned, my mom preferred a very simple chocolate glaze. I have taken to liberty to coat the entire mostaccioli cookie with dark chocolate. 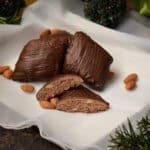 I am quite confident that you would enjoy this traditional Italian Mostaccioli di Mamma cookies with a nice cup of coffee… or espresso, or tea, or milk, or just about any beverage!!! 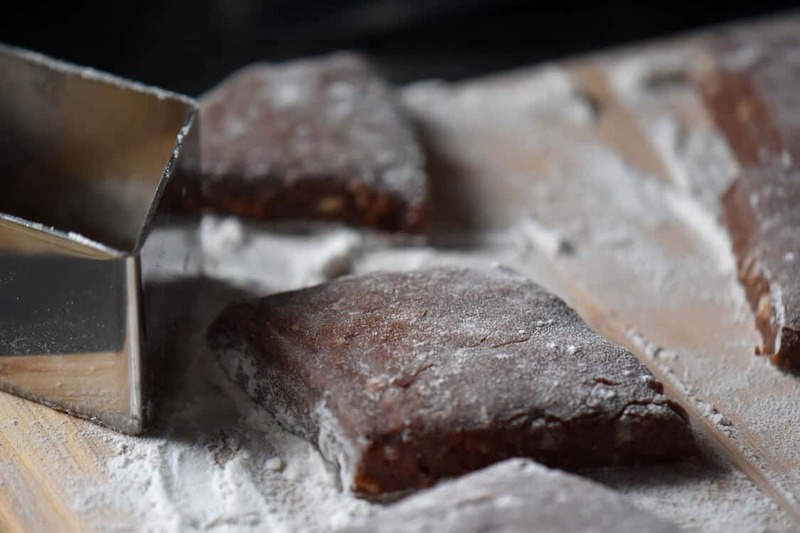 I truly hope you enjoy making and eating this wonderful Southern Italian cookie. Gotta go, the coffee is ready! ★★★★★ If you have made this Mostaccioli recipe, I would love to hear about it in the comments below and be sure to rate the recipe! 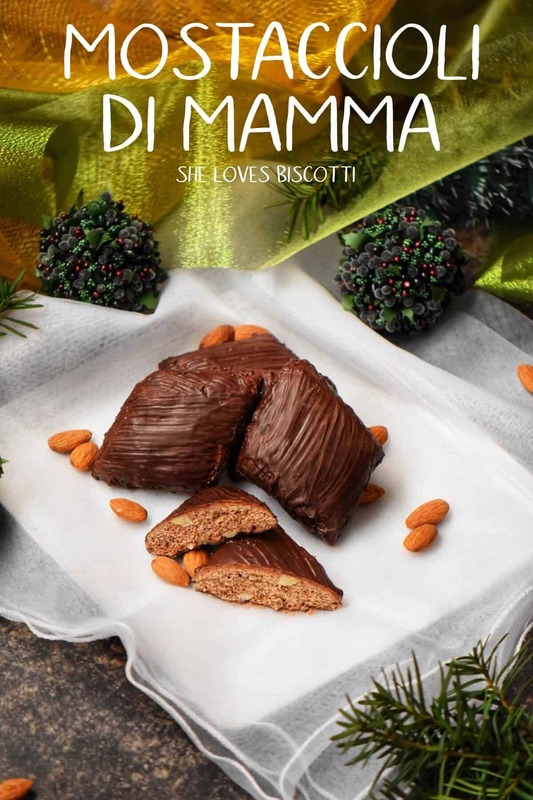 These traditional Italian Mostaccioli di Mamma cookies are a must for your Christmas holiday cookie platter. They are an almond based, soft,chocolaty, spicy, honey-flavored cookie. Preheat oven to 350° F. Position rack in the center. In a large mixing bowl, sift together dry ingredients. (flour, baking powder, cloves, cinnamon, and cocoa). Add ground almonds and incorporate with the dry ingredients. Set aside. In a large mixing bowl or the bowl of an electric mixer fitted with the whisk attachment, beat the eggs for 2-3 minutes. Add honey. Continue to whisk until well thickened. Add orange zest, juice and extract. Switch to paddle attachment. Add flour mixture until just combined. (Dough will be soft and sticky). Working with dough in small batches, place on well-floured wooden board and roll out to 1/4 - 1/2" thick. With a rhombus-shaped cutter or with a knife cut dough (I use a 2-inch cutter). Continue until all the dough has been shaped. Leftover dough trimmings can be re-rolled. Bake at 350° F for about 15-18 minutes or until firm to touch. Let cool completely before glazing with chocolate. If you find the dough too soft to handle, you can add a little bit more flour. Also, you can try refrigerating the dough-the honey will make the dough firm up a little bit. As every oven is different, I recommend baking one cookie in order to get the right baking time. Remember, when the cookies are firm to the touch, that is to say, leave no imprint when gently touched, they are done. The longer they stay in the oven, the harder and crispier they get. For the chocolate glaze, melt the chocolate in a double boiler. 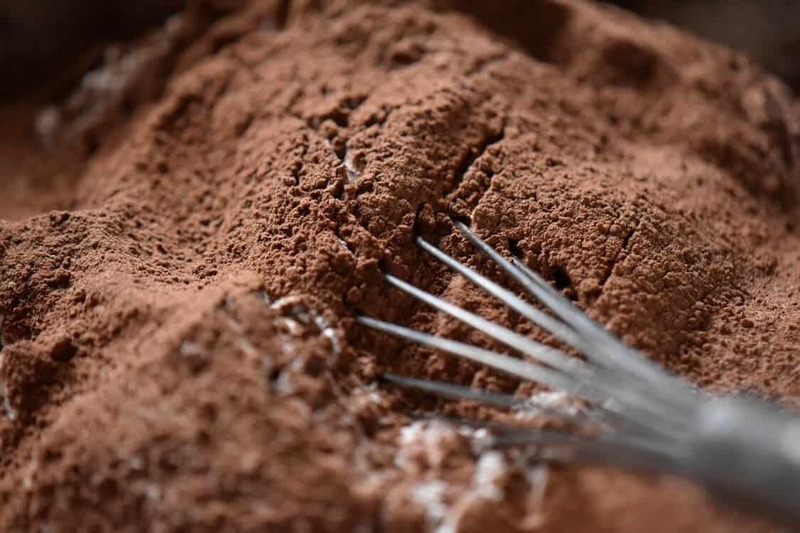 With a pastry brush, coat the mostaccioli with chocolate. Can be stored in an airtight container, in a cool place for weeks. IF YOU ENJOYED THISMOSTACCIOLI RECIPE POST, SAVE IT FOR LATER. PIN IT TO YOUR ITALIAN COOKIE BOARD! Mine turned out dry. I think 10 minutes will be better…next time I bake these… and the half inch thick. I loved the taste , but they were too hard with the 15 min baking with 1/4 inch. A lot of work . My neighbor gave me his Italian moms cookies. ( these) I had never tasted them before. I plan on giving the ones I made to his family with my other Christmas cookies. I wanted to show my appreciation. I just hope they are not too dry for their liking. No time to redo. I would like mire spice and softer… but Im not Italian …. so Im winging it! Hope they enjoy. I ate 4 testing … I was hoping the chocolate would help the dry taste . Hi Jen, appreciate your feedback. The variations of oven temperatures are very challenging to say the least. I recently baked these at a friend’s house and I had to lower the temperature 25 degrees as she has a convection oven. That being said, the chocolate glaze should soften the cookie.The flavors also become more pronounced. I always include the visual clues to help determine the bake time to help with variations (1/4-1/2 inch thick). Perhaps I will re-emphasize the visual cues in the recipe. I also think I will revise the recipe to encourage a trial test run before baking a whole batch. Wishing you and your loved ones a happy holiday season! Thanks so much, again, and Buon Natale! Looking forward to making this recipe! Can I use roasted almonds, it is what I have on hand. Thanks! Oh my gosh these are delicious!! I made with Trader Joe’s roasted unsalted almonds, what I had on hand, and dipped in Trader Joe’s dark chocolate……amazing! This makes a lot of dough, I froze part of it to bake off later in week. I hope freezing dough is ok? Maria I made a batch of these yesterday and very much enjoyed your IG post. Thanks for your recipe and giudance. This looks fantastic!! I was just trying to figure out what kind of cookies to bake to bring to my coworkers. This looks perfect!! All I need to get honey and almonds. I don’t usually have them in the house (mainly because I find them expensive), but this recipe looks worth it! Hi Maria , what kind of almonds do you use for this recipe? Raw almonds, or roasted, or roasted and salted ? They look delicious and I’d love to try them. Thanks! YOUR SITE IS AWESOME!! SO GLAD TO HAVE FOUND YOU!! I AM ENJOYING FINDING ITALIAN COOKIES THAT I HAVEN’T HAD IN YEARS. & CAN’T GET BECAUSE ALL MY RELATIVES ARE GONE NOW. I AM ANXIOUS TO TRY THESE THIS YEAR FOR MY COOKIE TRAYS. Can you please specify what kind of cocoa and chocolate you used? Bittersweet, baking, dark, milk… so many kinds make for such different results! I always use a dutch dark cocoa in my recipes. As far as the chocolate is concerned, I prefer to use a bittersweet(at least 70% dark) chocolate. I will usually buy it as a block. Can you tell I just love the flavor of these dark chocolate products 🙂 I have made these specifications on the recipe card. Please let me know if there is anything else I can help you with. Thank-you so much for taking the time to comment. I appreciate it! I know I shouldn’t be looking at cookies – what with it just being January 4th and all, but this cookie came to my attention and I can’t wait to give it a try. I’ll need to convert it to gluten free, but these look amazing. So glad I found your site. If you have a minute, I’d love it if you’d check out my site – http://www.glutenfreefarina.com. Thanks and all the best in the New Year. I feel exactly the same way 🙂 Of all the cookies one could possibly have, this is my number one. It would be awesome to have a gluten free version of mostaccioli! Thanks Deb, all the best to you and yours for the New Year also. I tried this recipe and it is great. Mostaccioli came out perfect:) Thank you! If I put them in a closed container in the fridge will they keep better and for how long, do you know? Thank-you so very much for taking the time to comment. My favourite too!! Looooove ”mustacciolis”! Have never tried making them but will give it a try thanks to your recipe, I promise!